Not to mention how great it is to be able to serve coffee on draft! Cold Brew Avenue has partnered with Keg Outlet for all of out nitro coffee kegerators and components to bring you the highest quality systems available! We have fully-loaded, ready to use cold brew coffee kegertaors that come with literally everything you need to start serving coffee on draft! Or if you already have a refrigerator or different master plan for your draft system that you would like to build, we have all the components and know-how to assist you in doing this as well! Until only recently, making anything over a few gallons of cold brew coffee was very difficult. The equipment was not available to do so, yet there was a need for coffee shops, roasters, restaurants, and even the avid at-home coffee lover who wants to have his iced coffee on draft and ready to go every morning for him! 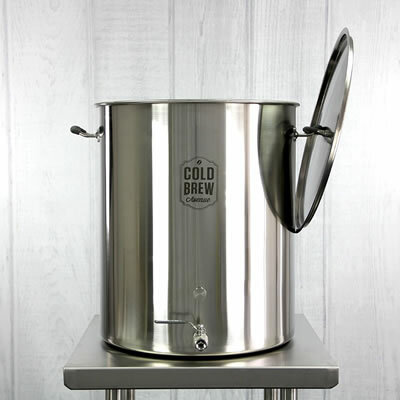 Cold Brew Avenue is the first to offer a completely stainless steel large batch cold brew coffee maker that allows you to brew as little as a few gallons all the way up to nearly 30 gallons at a time! Up to a 30 Gallon Capacity (w/ gallon markings) for easy measuring. Ease of Cleaning - Lift out your cold brew coffee filter basket and rinse out. Stainless steel is very durable and easy to clean! No mesh bags to deal with getting all the coffee grounds out of after each brew. Ball Valve - Easily start and stop the transfer of your cold brew to your keg or storage vessel. Custom maximizer dip-tube that allows you to get every drop of cold brew out of your kettle. Handles - Provide comfort and better grip when moving. Removable Lid that hangs on side handle. Thermometer hole punch for optional Cold Brew Thermometer for monitoring your coffee temperatures while brewing. Choose your barb size - Threaded Ball Valves allow you to attach any barb size you need to then attach a transfer hose to. Stainless Steel Mesh Filter Basket - Forget about having to buy replacement nylon filter bags to steep in, this basket will last a long time! And the fine micron mesh that our filters use will give you a much cleaner cold brew coffee straight from the system! Sanitary - Our system is made completely of 304 Brewer's Grade Stainless Steel! Hot bloom: Since our system is made entirely of stainless steel you can combine both cold brew and hot bloom methods on a large scale!